Evangelicals, Americans in particular, hold the Bible to be the “word of God.” And as such the Bible should function as the authority for Christian faith and practice. For some this means that the Bible can provide the answers to many, if not all, of life’s questions, problems and dilemma. 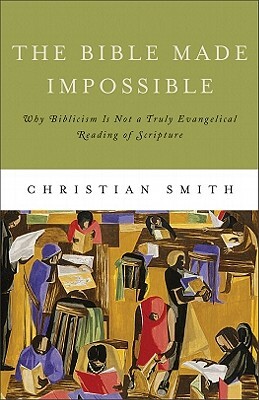 In his book The Bible Made Impossible (Brazos, 2011), Christian Smith argues that this view of scripture is unhelpful and, ultimately, unsustainable. Smith hopes to reveal this to his readers and to provide them with a better way to approach and interpret the Bible. Smith acknowledges that there are a variety of definitions for what he calls “Biblicism.” The one he focuses in on is that which treats the Bible like a handbook for living. He has in view here those who think that any answer to any question can be found in the Bible. As an illustration of this approach he points out the numerous books published each year that claim the Bible has the “answer” to any number of personal or social ills. He lists books on a range of topics Bible Diets, Bible Answers, Biblical Psychology, Biblical Principles for Finances and Bible Recipes. Such titles assume that there is an answer to the problem that can be found if the reader just digs deep enough into the Bible. The biggest problem with this approach to the Bible, according to Smith, is that it doesn’t work. To assume that the Bible has the answers to everything is to overlook the problem of pervasive interpretive pluralism. In other words, there are lots of differing interpretations of different scriptures. For example, there are a number of types of church polity in existence many (if not) all that claim to be based on the Bible. If the Bible details the way a church should govern itself why don’t the faithful follow one method? Similarly, there are debates over free will and predestination that are based on the Bible. Or what about the Sabbath? Why are some churches stricter than others and some worship on Saturday rather than Sunday? Finally, what about such topics like slavery? Both abolition and pro-slavery groups claimed their position was right based on the Bible. Moreover, reading the Bible this way creates some subsidiary problems. There are parts of the Bible that are ignored (did greet anyone with a holy kiss today? ), arbitrarily determined to be culturally relative (most people don’t worship idols but will eat a pork chop), and many of the practices that are in place violate the principles of a Biblicist reading (the Bible says to stone a rebellious son, but most Christians don’t advocate that form of punishment). Smith suggests a new way forward. First of all, he promotes a Christocentric hermeneutic. He suggests that the entire Bible be read with Christ in view. Christ, he argues, is the true and final word of God and the Bible only points to Christ. Christ is the interpretive key to understanding scripture. Second, Bible readers need to accept the complexity and ambiguity of the Bible. This means acknowledging that the Bible does not address every topic and therefore does not have the answer to every question and/or problem. Along with this, readers also need to resist the temptation to harmonize the Bible; to make it agree in places where it does not. He also suggests that there needs to be a better understanding between dogma and doctrine. Too often, he argues, a confusion of the two has led many to claim that they have the “correct” interpretation of the Bible and all those who hold to another are, therefore, are not true believers. Finally, not everything in the Bible needs to be replicated. There are some (many) things in the Bible that do not necessarily apply to us today. Smith’s hope is to sound a clarion call for evangelicals to change the way they read and use the Bible. Overall I agree with much of what he writes and even found myself wincing sometimes as I realized that I still think about or use the Bible in some of the ways that he describes. Old habits and patterns die hard. Other times I felt like he was preaching to the choir, but that is because I am aware of many of the problems he highlights. I think he is to be commended for his effort to raise awareness of this issue. Too many Christians have a handbook view of the Bible, and are often disappointed when the “divine instruction manual” doesn’t produce the desire results. The only drawback to the book might be that it will be a bit technical for some. It seems clear that Smith is aiming for an audience that is somewhat educated and willing to think more broadly. I can’t imagine handing this book to many people in church and expecting them to be fully convinced. It would take much more than is here and a lot of pastoral interaction. And perhaps that is for whom this books is best suited; those in teaching and preaching ministries. Hopefully they will read Smith and begin reversing the tide of Biblicism in America and beyond.